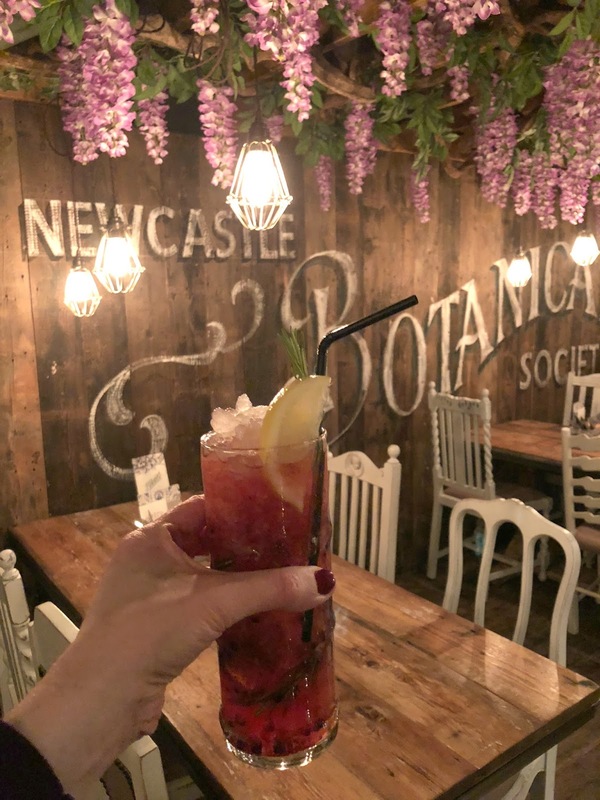 Christmas at the Botanist in Newcastle is something I look forward to every year, for me it's always the official start of Christmas - a chance to snuggle up with some close friends, enjoy a few tipples and chat festive plans. Earlier this week I spent the evening with six of the loveliest ladies I know at The Botanist and after a night of mulled wine, over indulgence and plenty of giggles I'm definitely feeling very lucky to have such wonderful friends to share my Christmas time with. Our night of celebration began on the roof terrace which is the perfect place for a cosy Christmas with a few of your closest mates. We were lucky to have a really clear night where it was mild enough to sit outdoors for a short while but still nippy enough to treat ourselves to mugs of hot cider and cover our knees in cosy blankets. 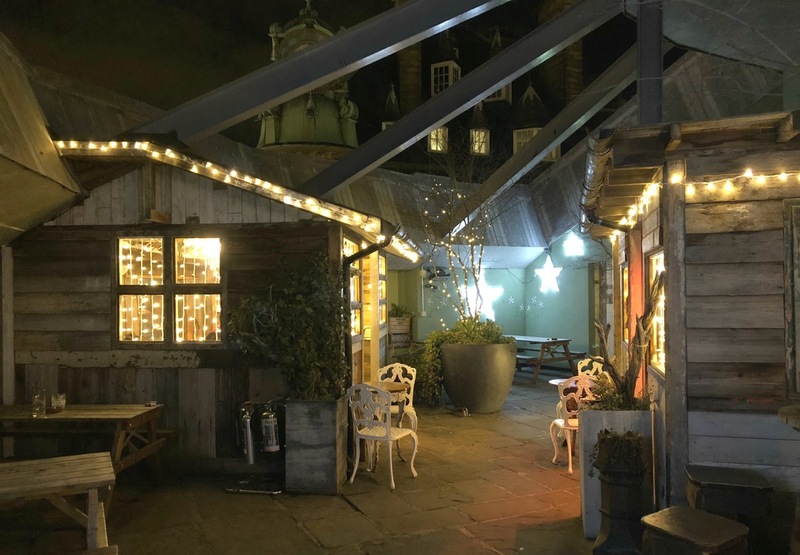 Whilst you might think that the Botanist Roof Terrace is just for those Summer days it's definitely somewhere that I love most at Christmas time. 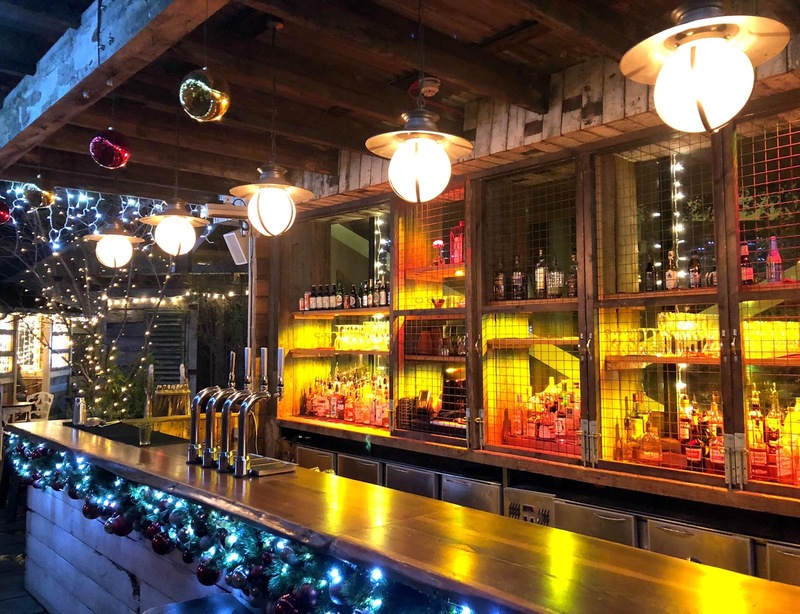 The wooden huts seem extra beautiful with their little fairy lights, the bar is decked out in giant baubles and the hidden corners and snuggly blankets gives you those apres ski vibes without having to actually get cold and do any ski-ing - perfect! A great place to people watch, we spent a fair amount of time watching the Christmas Market at Monument down below. The Newcastle lights look extra special from the roof of the Botanist! When our tummies needed a little extra warmth we lined up at the bar, eager to try out the Botanist's latest creation, the Budweis Mule (£7.95). A twist on the classic Moscow Mule the "Hoptail" is the perfect way to convince the beer lover in your life to join you on cocktail night. Traditional ginger beer is replaced with Budweiser Budvar original and fresh ginger is then mixed with Tanqueray gin and Cointreau. 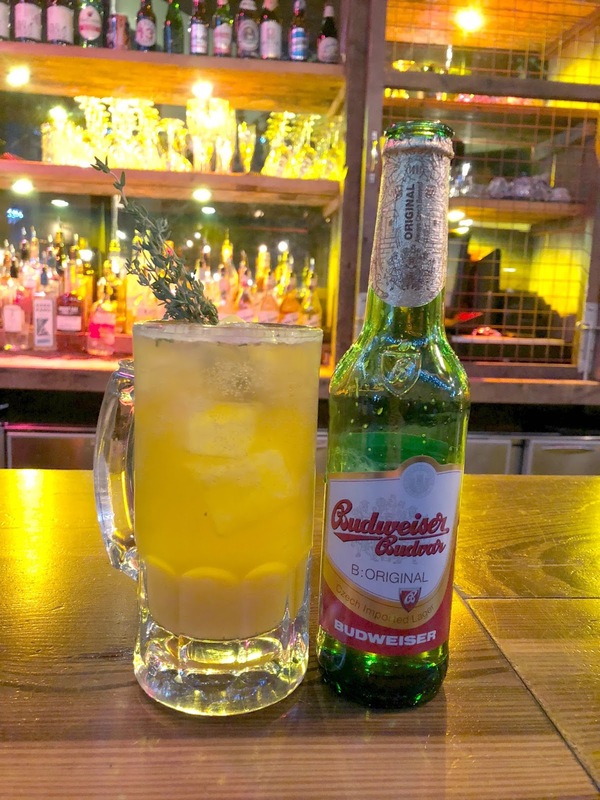 It's pretty damn special as The Botanist is the only bar in the region to serve Budweiser Budvar, brewery fresh tank beer from the Czech Republic. I have to admit I'm not a huge lover of beer but with the nice subtle sweet hit in the Budweis Mule I could definitely manage a pint! Fingers, toes and tummies warm from our Winter drinks we headed indoors and up to the new Mezzanine level to sit down for some Christmas food, the Mezzanine is the perfect place to host your Christmas party this year - nicely tucked out of the way with the most amazing views over the bar and that famous tree! The Christmas menu at The Botanist is available through December with Lunch for £22.75 per person and dinner for £27.50. 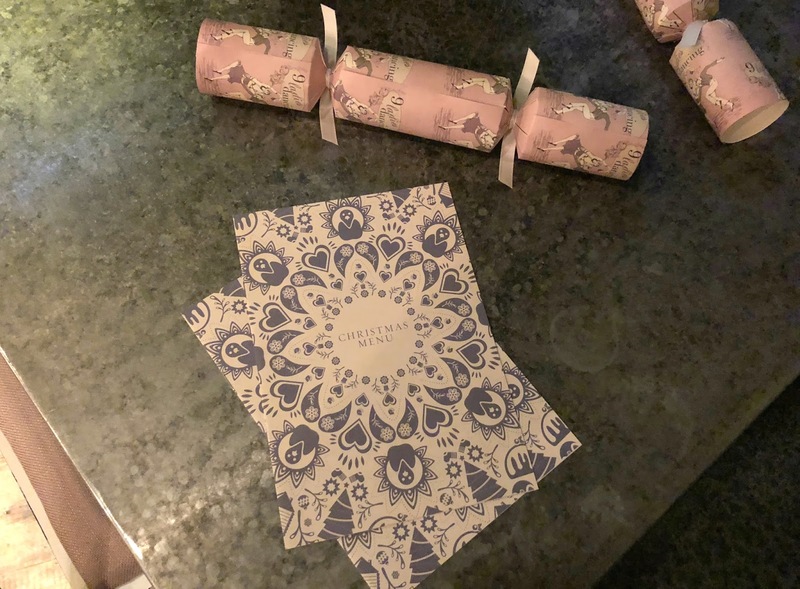 When the festive menus started doing the rounds I have to say that it was the Botanist menu that caught my eye - with so many of my seasonal favourites featuring it was the only place I was adamant I had to try this Christmas. There are three choices of starter at The Botanist this Christmas with dishes to suit every taste. First up, the Smoked Salmon Rillettes with avocado salsa, homemade chilli jam and olive oil croutons. The perfect light starter if you want to be sure not to get too stuffed before the main event. Christmas lovers will love the Curried Cauliflower and Coconut soup with toasted almonds and curry oil, the perfect Winter warmer. 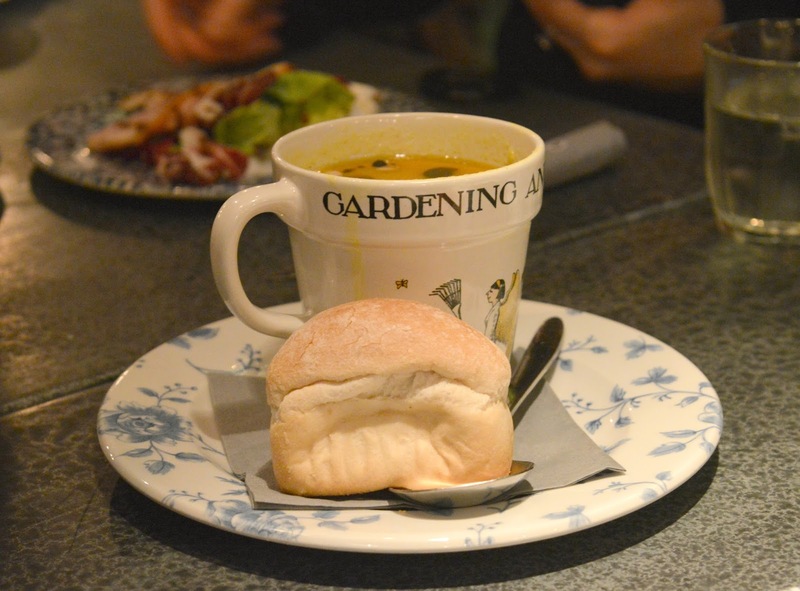 Served with a delicious squishy bread roll, perfect for dunking - no need for table manners when you're out with your friends! My personal favourite Christmas Starter of the evening was the Roast Jerk Ham, Celeriac and Apple Remoulade with Honey Mustard dressing. We always have ham at Christmas at my parents house so it will always remind me of cosy festive evenings back at home. 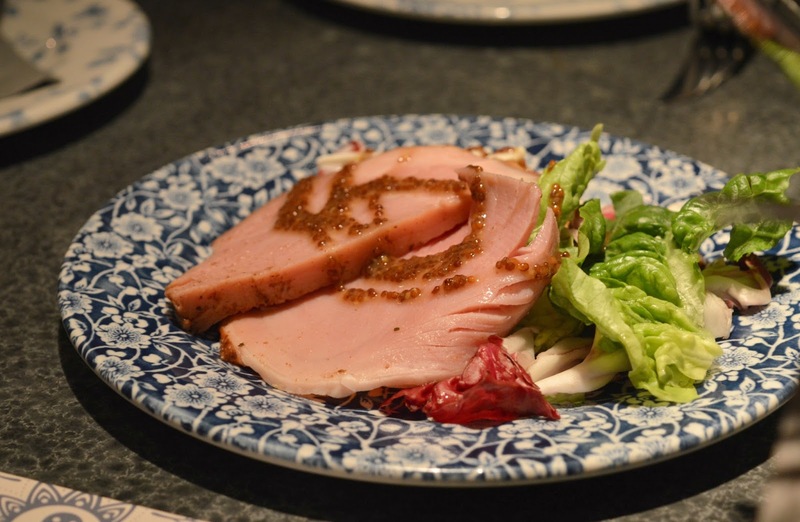 Back by popular demand, would it really be Christmas without the Turkey Hanging Kebab with Spiced Cranberry Glaze? Served with a tiny pot of gravy (I have to admit being the only southerner at the table I didn't really understand the gravy debate that was happening at the table! ), the kebab hangs above a dish of seasonal veg and is such a fun way to enjoy your Christmas dinner. 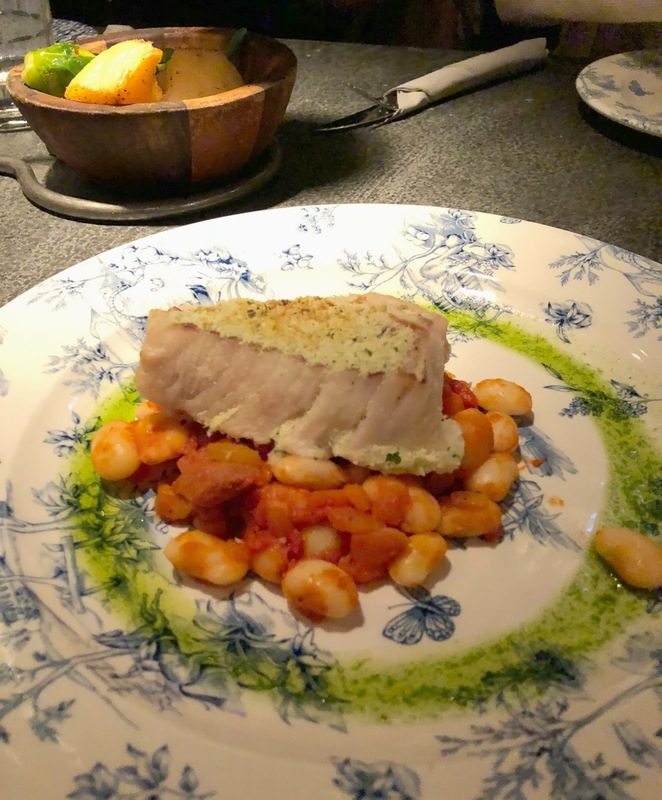 An alternative to the traditional, we all loved the Backed Cod in Herb Crust with a Chorizo, Tomato and Butterbean Stew - although I love a full turkey dinner it's great to have a menu with plenty of delicious alternatives. For the meat lovers the Sirloin Steak with Braised Spiced Red Cabbage, Smoked Bacon and Thyme Sauce went down a treat. I have to say it wasn't served rare enough for my liking (I like my steak to be crawling off the plate) but everyone else wolfed it down. 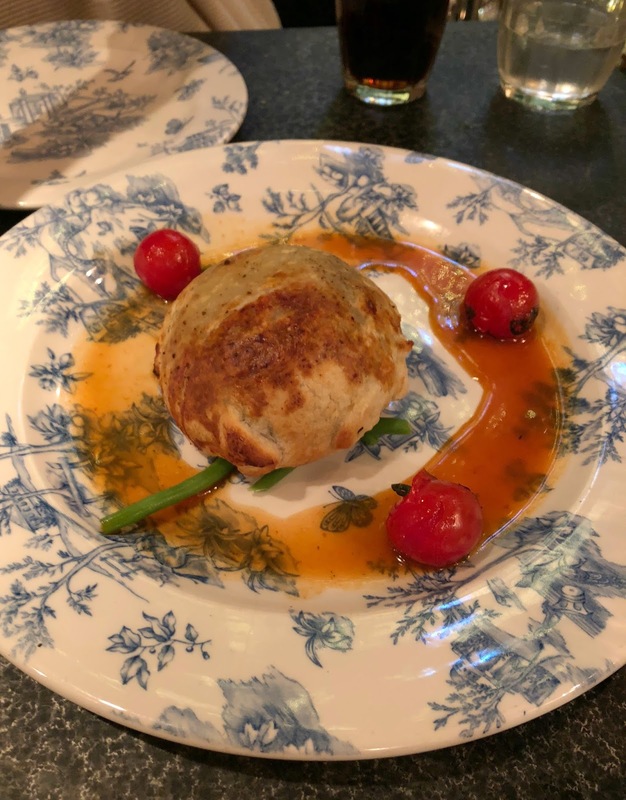 My favourite of the night, and the dish that had my mouth watering when I first saw the menu, was the Roast Butternut Squash and Mushroom Wellington with Goat's Cheese, Chestnut, Sage and Roast Cherry Tomatoes. I love a classic Beef Wellington and this veggie version worked so well, I was supposed to be sharing but I will admit I polished most of this off myself. As a huge lover of Bakewell I was very intrigued by the first dessert at our table, the Christmas Bakewell Tart with Orange Brandy Custard, it was so lush and I'm now thinking about having something similar on our Christmas table at home. 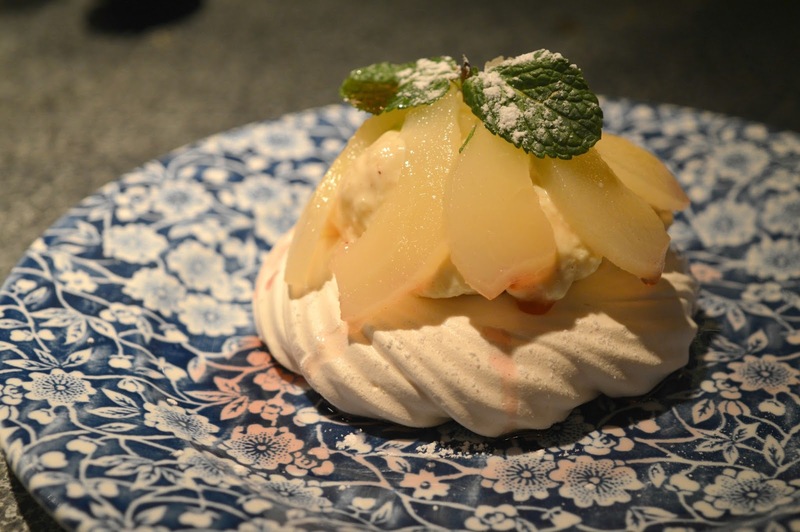 The Cranberry and Raspberry Meringue with Poached Pear and Eggnog Cream was the other dish that had me excited to book a table at The Botanist, I am an eggnog obsessive so am in my element at Christmas time. The eggnog goes so well with the perfectly chewy meringue. 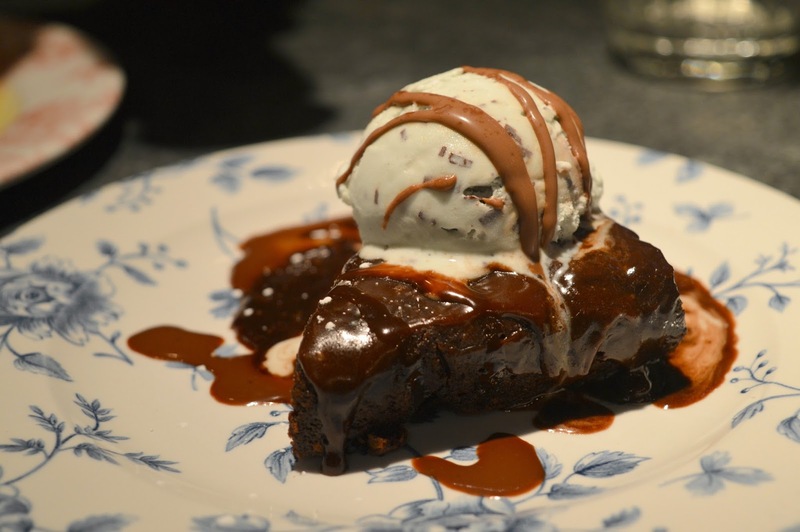 The first dish to be completely cleared at our table was the Chocolate Fudge Brownie with Mint Choc Chip Ice Cream which we all attacked with such enthusiasm I'm surprised there wasn't an argument. So delicious I definitely suggest you tuck into one of these bad boys on your own and don't even attempt to share it with anyone else. We loved our evening at The Botanist and I'm definitely planning a few more visits before Santa arrives! 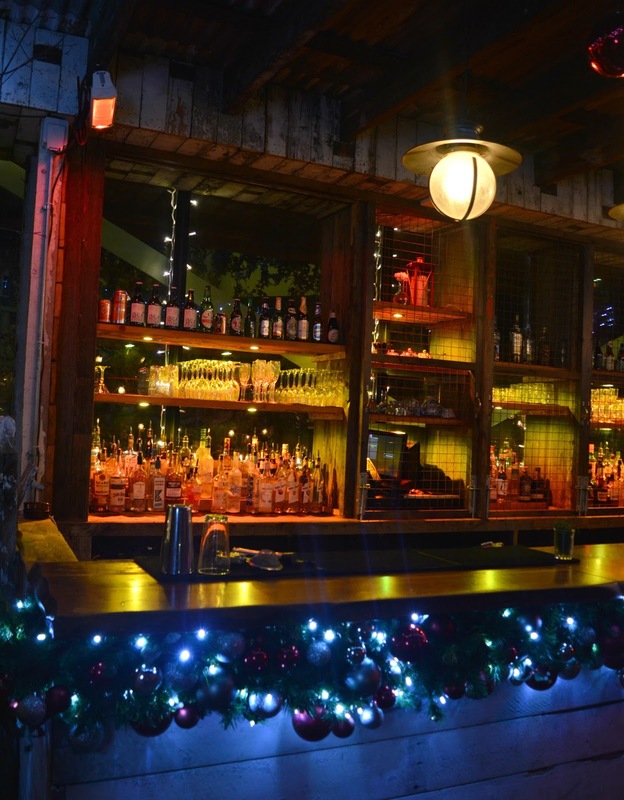 Is anyone else planning a Christmas night at The Botanist? For more Christmas inspiration follow New Girl in Toon on Instagram and Facebook. 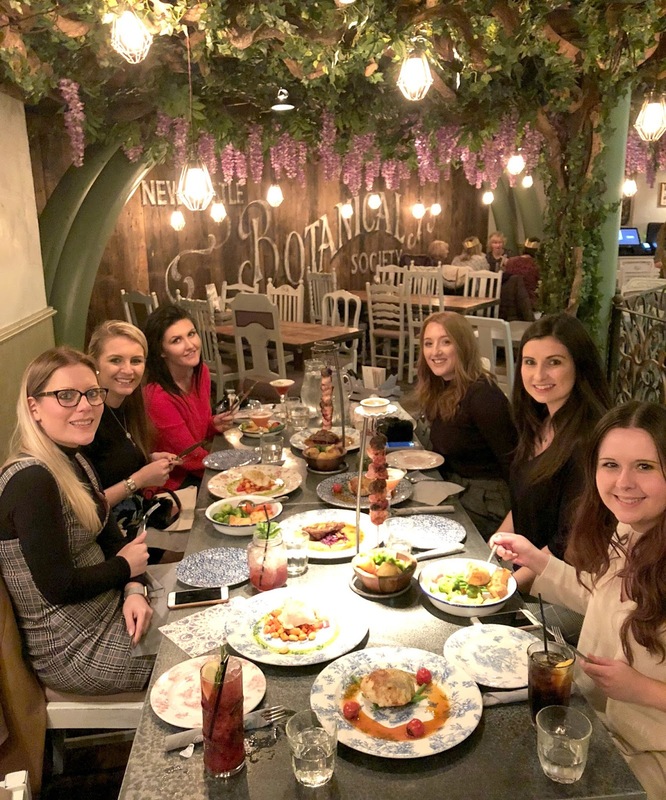 We were treated to complimentary food and drinks at The Botanist in exchange for an honest review of their Christmas offerings. Was gutted I couldn't make this it looks like a lovely night. Definitely need to pay a visit to the Botanist over the festive period!